So, the original plan was Two Go Mad For Two Weeks in Vancouver visiting the Olds and the new life they have started. Well a month of silliness led to the trip west being shortened by a few thousand miles and the new destination being Devon, 5 miles past Tavisock on the lovely Norton Farm in Bere Alston. 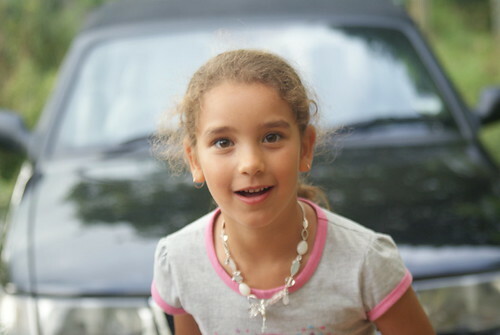 Ellie and I took the new motor, my new Saab 900 convertible (I miss my Alfa...) and top down, we sat on the M4 for 2 hours before being released westerly and off to our first proper holiday, just us. 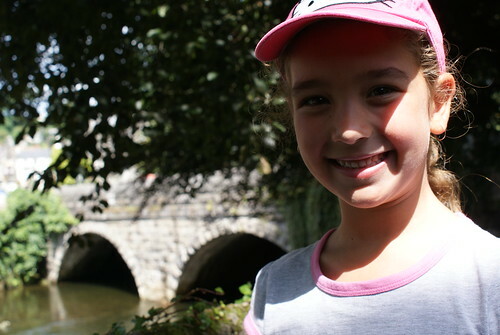 So we moved and had a lazy Sunday, wandering around Tavistock, and along the banks of the Tavy. The funny thing about the trip as a whole was the insane amount of giggling. I mean a committable amount of giggling. That coupled with an epic, downright ruthless, three day running game of Monopoly, meant mornings were spent with much merriment. Add to that a pack of High School Musical Uno and breakfast was a highly charged occasion, for all the right reasons. One of the promises of the trip was Horses. 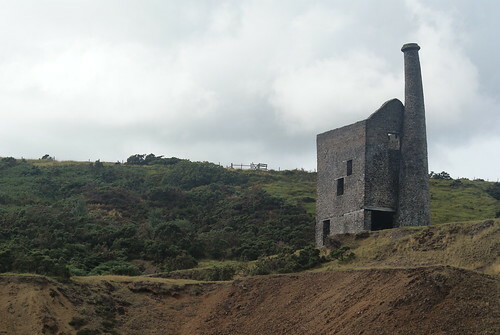 So, in the shadow of the ruins of the Wheal Betsy Mine, Ellie and I mounted Bella and Carousel and rode out in a Dickensian Dartmore Fog for an hours walk and trot. When I say a Dickensian fog, I mean a fog so thick that I half expected Able Magwitch to stumble out of it and drape himself across the neck of my horse. Now I'm not un-fit, a slight belly, but a rather trim chap am I. I play football regularly and tend to walk whenever I can, but not having ridden for a good fifteen years, I exercised muscles that I truly had forgotten I had. Ellie, on the other hand, lost enthusiasm for the whole adventure after 35 minutes when her bum started hurting. This I can attest to, as an English saddle is a terrible thing. Give me a Western one any day and I'll ride to where the sky meets the ground and back. An English one is designed to cope with someone ridding side saddle, which should say it all really. 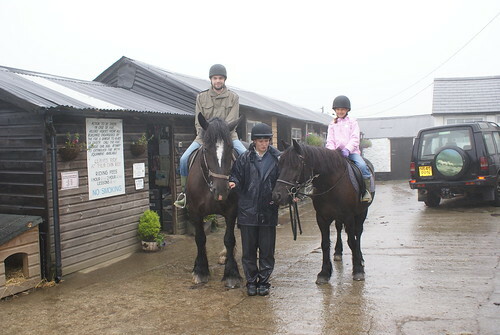 Anyways, rain, fog and prodigious mud led to an enjoyable morning. Ellie couldn't get her head around why I liked the fog, but it was hauntingly beautiful, thick, billowing and as perfect a Moor fog that your mind condors up when buried in Conan Doyle. We followed riding the next day up with a trip to the Eden Project. Luckily, it was an odd numbered day of our holiday which meant the sun was out in force. Ellie was dubious about going to "a garden in a dome". Granted, my description is lacking and in no means doing the place justice. But as we walked out of the entrance, following the purchase of our tickets (which, if your a UK tax payer, made your entrance "donation" Gift Aid, you get free entrance for the next year. Not bad really.) you are confronted with Eden in man's form. It is quite impressive what you can do with a quarry when you put your mind to it really! The Biomes are impressive, and the layout is perfect. A quick lunch, was followed by a journey into the Jungle. Now, it was 29 degrees in the quarry, you walk through the doors and into lush, shockingly green Jungle. 41 degree Jungle! Running around and chasing someone who decided that "its not THAT hot dad!" was a workout and a half. 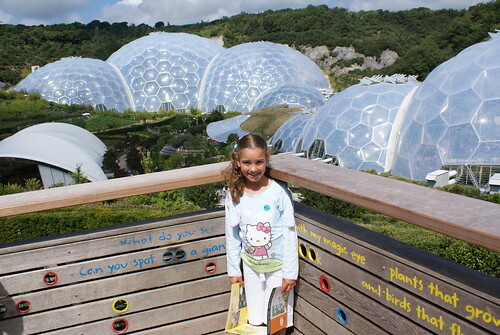 We took in both Biomes before diving into the Summer Survival excitements. We made rafts out of rubbish and then moved onto the shelters. 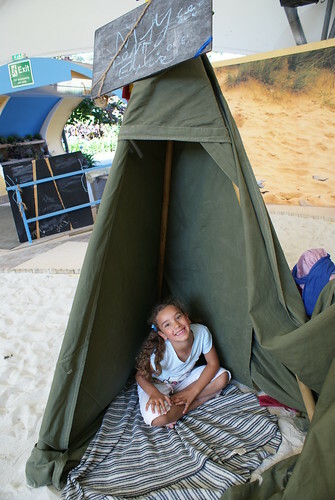 Inside the Activities thingy, I taught my daughter a bit about her heritage, we built a Tepee! All in all, it was a manic, wonderful day. Leaving, hot, tanned and a touch worn out, we detoured to Looe for a paddle in the sea and fish and chips. Here we threw stones and generally goofed off for a while before heading home. Bit hard to follow that up, but we did! 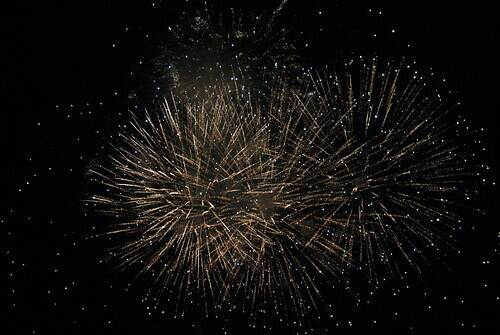 Plymouth holds the British Firework Competition each year. So heading down to Plymouth Harbuor, the departure point of the Roanoke settlers, The Mayflower, where Drake was knighted on the deck of the Golden Hind after sailing around the world and nearly bankrupting Spain. Ellie and I walked up to the Hoe, where Drake and Howard finished their game of Bowls before setting out to face the Armada. 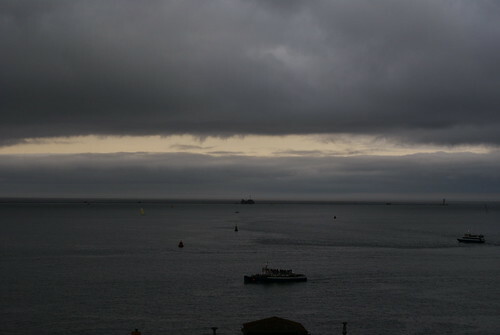 It was not a good night for firworks, low broken cloud and a generally moody evening. But that did not stop the fun. Ellie got a flashing wand and a mini kite to keep herself busy till the sun dropped, and I, thanks to a random who sat next to us and had the same camera as I just bought (Sony A200 DSLR if your interested!) and helped out with shutter settings for night shots. Think he helped, what do you think? We had a fantastic time, before heading home after a long and late night. We finished the trip up with a final day on the beach at Paignton Sands and dinner in Tavistock. We had a wonderful time. To be able to spend so much time with Elles, just us, was utterly magical and, of course I miss her like terrible now! Next is to get her to Canada for a proper trip and meet the rest of her's, my, family.